East Texas Baptist, Hardin-Simmons, and Belhaven have used new helmet designs in 2018 (shown above). During the 2017 season Belhaven used six different helmet designs in the following sequence: N-U-U; V-V-W; W-X-X; Y. In 2016 Belhaven used at least seven different helmet designs in the following sequence: N-O-P; Q-R-R; R-S-? ; T (no information for game #9, November 5 vs Mary-Hardin Baylor). 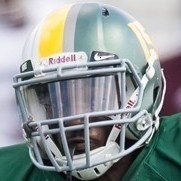 In 2015 Belhaven used at least six different helmet designs in the following sequence: H-I-J; J-K-K; L-M-M; ? (no information for game #10, November 7 vs Sul Ross State). Belhaven used seven different helmet designs in 2014 in the following sequence: A-B-C; D-E-F; G-G-G; G-G.
1998 was the first year for the Belhaven football team. *1 The left and right sides of this design were different colors; the right side appeared as below. *2 The left and right sides of this design were different colors; the right side appeared as below. *3 The left and right sides of this design were different colors; the right side was white and had a yellow stripe which was approximately twice as wide as the gray stripe on the left side of the helmet (see photograph below). I have been unable to located any photographs showing what (if any) additional features were present on the right side. *4 Uniform numerals were worn only on the left side of this design; the right side featured a green "B" logo (as depicted below). In 2017 ETBU used three of the above helmet designs in the following sequence: A1-A1-C; B-C-A1; A1-A1-A1; A1. In 2016 ETBU used: A-A-B; A-B-A; A-A-B; A. The ETBU football team was restored in 2000 following an approximately 50-year absence (exact last year of earlier team is unknown). *1 In 2014 uniform numerals were worn only on the left side of each helmet; on the right side was worn a large "tiger head" logo (as shown below). *2 Designs 'A' and 'A1' both have uniform numerals on the left side only of each helmet; logos are present on the right sides (as shown below).
? - 2002 2003 - ? ? - 2017? *1 The "JACKETS" logo is worn on the left side only of this design; the right side features a large outline of the state of Texas with a "yellow jacket" (as depicted below). Louisiana College had a football team through the 1968 season, after which the team was discontinued. It was restored in 2000. The UMHB football team first played in 1998 and the above are the only "known" helmet designs used by this team. McMurry's 1962 football helmets featured a strange symbol that I cannot identify from the clearest available photographs (below). What is it? Does anyone have a clearer photograph? In 1986 another "Indian head" was used; this one with the team name in arched letters above the logo. I would greatly appreciate better photographs of any of these helmets or additional information, particularly from former team members, equipment managers, etc. The 1991-1993 helmet featured the same "McM" logo worn on the previous helmet. I am unsure about the colors on this helmet, but it would appear that the helmet shell was silver and that the logo was maroon. In 2007 and 2008 McMurry used the helmet design shown in the photograph below. The helmets were maroon with a new logo, a large "M" with the school name across it. I would appreciate a copy of the helmet logo for this one, which would enable me to add this historical helmet to the web site. *1 This design has uniform numerals on its left side only; the right side is 'blank'. This team played its first season of football in 2013. *1 The "SU" logo is worn on the left side only of this design; uniform numerals are worn on the right side (as represented below). During at least the 2002 season, Sul Ross used a "wolf head" logo on the left sides of its helmets; the right sides featured the same "SR" logo as was used from 2003 through 2008. I would appreciate a copy of the "wolf head" logo, which would enable me to add the 2002 helmet to this web site. An earlier helmet is shown below; this photograph is reported to be from the 1995 season and shows a script "Lobos" logo on a red helmet shell. I would appreciate a copy of the logo used on this helmet. This team used a new helmet design in 2008 (see photo below). The logo was apparently a "bulldog face" in front of an outline of the state of Texas, which is enclosed by an unusual square border. I will need a copy of the helmet logo in order to add this helmet to the web site. The logo was apparently worn on the right sides of the helmets only; the left sides being "blank".